Comfort, power, and good looks define the new Livestrong LS16.9T treadmill. 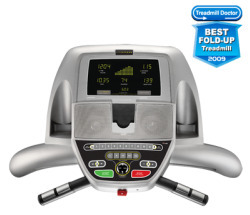 Debuting in December 2009, this new machine is priced at $1699 and ready to deliver health club quality workouts in your own home. The Livestrong LS16.9T treadmill’s multiple LED display windows show time, distance, calories/heart rate, speed and incline. The 14 pre-set programs include Speed Intervals, Peak Intervals, Weight Loss, Rolling Hills, Foothills, Mountain Climb, 5K/10K, Race Pace, Custom (2), Target Heart Rate Zone, HR Intervals, and Manual. Unit Weight/Dimensions — 264 lbs; 79" x W: 36" x H: 58"
Equipped with a 3.25 CHP whisper quiet motor, the Livestrong LS16.9T treadmill is the best of the line from Livestrong and well earns its endorsement from pro cyclist Lance Armstrong. 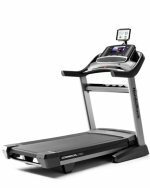 It has a roomy 60" long ortho belt running track, a big 15% incline for hitting the climbing portion of endurance runs, and HR monitoring for optimum fitness training. You’ll stay motivated too, thanks to premium Pioneer speakers and an iPod plug-in port that ensures you can run (or walk) to your favorite tunes. Should you have any problems with the LS16.9T, it is backed by Livestrong’s 5-year warranty on all parts and 2-year in-home repair service. This is among the best warranties for treadmills under $2000. This treadmill is turning a lot of heads and getting good endorsements from users and treadmill techs. If there is something to complain about the Livestrong LS16.9T it would be that it is difficult to store, but then any folding model that weighs 264 pounds is going to a bit tricky to fold and roll. If you have room to leave it out, then this minor complaint isn’t even an issue. Another point was made by a couple of customers who stated that it was hard to assemble, but check the LS16.9T Owners manual and see for yourself how detailed the instructions are. These are some of the easiest and most complete directions we’ve ever seen for a treadmill. As for more important things, like power, performance, and reliability, the Livestrong LS16.9T provides nothing short of a rock solid, stable platform to run indoors. This is a great treadmill that has thrilled its new owners who are amazed at the health club quality of this machine. The LS16.9T is a beautiful machine with elegant lines, and will be the showpiece of your home gym as you log hundreds of miles a year, recorded for you automatically in the on-board fitness journal. 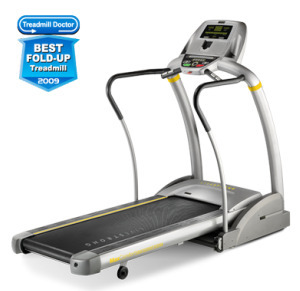 If you have been seriously considering the Sole F80 or one of the Smooth folding treadmills but can't make up your mind, the Livestrong LS16.9T treadmill is an excellent choice.